Welcome – Hansaplast online is all new. Find tips and advice and learn more about woundcare, footcare, beauty and your active life on this all-new platform. Welcome to the new online world of Hansaplast – one of the world‘s most trusted woundcare brands that offers you smart products, solutions and innovations. At Hansaplast, we want you to enjoy your active everyday life without worrying about the small inconveniences too much. Find out how to deal with them, be it a blister on your foot or a small wound, a sprained ankle or backache. Our INSTANT HELP sections will give you fast and reliable answers with some special expert tips. Browse and learn more about woundcare, footcare, and how to stay healthy when doing sports and activities in the MAGAZINE section we have created for you. Click through and find inspiration for the demands of your busy life. Life is not always smooth, but our mission is to help you keep going, no matter what: For almost every small inconvenience Hansaplast has adequate treatment. You will be surprised what we have developed to make your life easier: Find out how to avoid or reduce scars, how Hansaplast Foot Expert products can help you get rid of callus, how blister plasters will help you to keep on walking... Click through and discover lots of other exciting innovations that will help your skin, your feet or your joints stay healthy. We are the healthcare brand of Beiersdorf, one of the leading skincare companies worldwide, situated in Hamburg, Germany. Hansaplast has come a long way since the first Hansaplast Beiersdorf plaster, which we developed in 1882, when Paul Beiersdorf was awarded the patent for the first plaster. The start of an ongoing success story, driven by progress, quality and innovation. for more than a century For more than 125 years Beiersdorf has gained experience and competence in woundcare, more recently in the field of activity support and treatment of muscular pain as well, striving to improve woundhealing and care for your skin ever since. Today Hansaplast is one of the most trusted plaster brands in Europe, founded in 1922. Since then Hansaplast products have been known internationally for their leading quality. 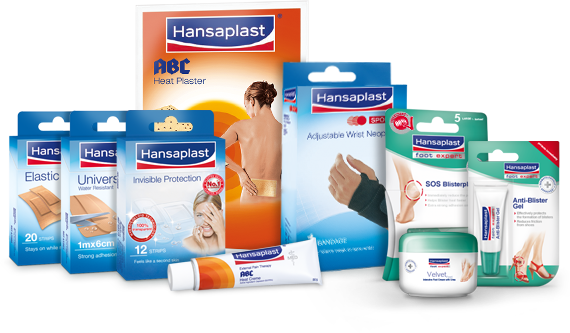 Over 200 tried and tested products and innovations are sold in countries from Germany to Chile, from the UK to Australia under the brand names Hansaplast, Elastoplast and Curitas. Apart from plasters and wound dressings, the product range includes well-tried as well as innovative products that offer solutions for foot problems, sport injuries, pains and strains. A worldwide brand that you and your entire family can rely on, as it offers you high-quality, modern solutions for the demands and small inconveniences of everyday life. So how did we get from one small plaster to all of this? Innovation and research have always been at the core of the Hansaplast business, combining tradition with the latest scientific developments: The scientific and cosmetic know-how we have accumulated at Beiersdorf in over 125 years in the fields of skincare, woundcare and tapes is something that goes into every Hansaplast plaster we develop. This is something that our customers can rely on and profit from every day. INNOVATION and EXCELLENCE Ongoing research and usage of the latest technologies ensure products of the highest standard which match demanding consumers’ needs for individual care. Always meeting the demands of an everchanging world, we strive for innovation and excellence in everything we do. Discover the defining highlights and milestones of more than 125 years of Beiersdorf health care history at one glance.